Colorful Guizhou Airlines, whose headquarters are in the city of Guiyang, Guizhou province recently completed its first flight as the province's first locally-owned carrier. Guizhou province has announced plans to put 40 billion yuan ($6.44billion) into a 3-year county road improvement project, starting this coming Jan 1. The global retailer Ikea says it is looking to cash in on growing opportunities to be found in China's backward southern parts and is planning to set up a store in the Yunyan district, Guiyang city, Guizhou province. Moutai, China's national liquor served at official occasions and state banquets, survived the country's frugality campaign and saw its sales revenues rise by 4 percent year on year from January to November. 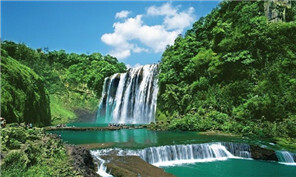 The city of Guiyang, Guizhou province which will be playing host to the 6th China International Alcoholic Beverage Expo, Sept 9-12, 2016, says it is hoping to build on its success at previous sessions held in the city. China invested about 768.7 billion yuan ($118.7 billion) in its less-developed western regions in 2015, the country's top economic planner announced Wednesday. The Global Big Data Exchange in the city of Guiyang, Guizhou province has done up to 60-million yuan ($9.27 million) in business in the last year. 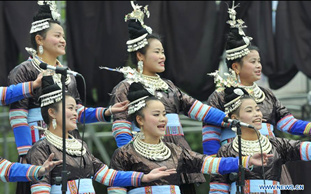 Performers of Dong ethnic group sing Ka Lau chorus, the big song of their distinguished folk vocal art, at a contest in Rongjiang county, southwest China's Guizhou province.